What would the conversation sound like to either of the listeners if the switch frequency was 1 Hz? What if it was 10 Hz? What if it was 40 kHz? At 1 Hz, a half-second of each conversation would be missing, every second. The result would be a very "choppy" stream of audio reaching each listener. At 10 Hz, the "choppiness" would be reduced, with only 1/20 of a second's worth of conversation missing every 1/10 of a second from each conversation. It would still be very difficult to listen to, though. At 40 kHz switching speed, both conversations would sound seamless. Follow-up question: how can we multiplex more than two conversations along the same pair of telephone wires? Challenge question: is there a limit as to how many conversations we can multiplex on the same wire pair? If so, what parameters would define this limit? Ask your students why this technique of switching conversations works. How is it possible for audio conversations to sound ßeamless" when half the information is missing from each one (regardless of switching speed)? Ask your students for answers to the challenge question. If no one has any, give them a hint: how does the bandwidth of the telephone lines impact multiplexing a large number of signals? Most modern analog oscilloscopes have the ability to display multiple traces on their screens (dual-trace is the standard), even though the CRT itself used by the 'scope may only have one electron gun, and thus only be able to "paint" one flying dot on the screen at a time. Oscilloscopes with single-gun display tubes achieve dual-trace capability by way of multiplexing the two input channels to the same CRT. There are usually two different modes for this multiplexing, though: alternate and chop. Explain how these multiplexing techniques work, and what conditions would prompt you to use the two different multiplexing modes. I strongly encourage you to experiment with displaying two different signals on one of these oscilloscopes as your research. You will likely learn far more from a hands-on exercise than if you were to read about it in a book! Chop is used to display two waveforms when the timebase is set to a slow (low-frequency) setting. Alternate is used to display two waveforms when the timebase is set to a fast (high-frequency) setting. Don't simply tell your students how the alternate and chop facilities of their oscilloscopes work. Let them experience these two modes of multiplexing directly, with hands-on investigation. If nothing else, this will provide them with additional practice using oscilloscopes. A variety of practical electronic applications require multiplexing, where several input signals are individually selected, one at a time but very rapidly, to be communicated through a single channel. Telephony systems use this technique to "concentrate" multiple voice conversations over a single wire pair, and most analog dual-trace oscilloscopes use this technique to allow a single-gun CRT to display more than one signal trace on the screen at a time. This hybrid analog/digital device uses digital logic signals (high/low) to activate the gates of CMOS transistor assemblies to switch analog signals on and off. It is like having four low-current solid-state relays in a single integrated circuit. When the control line is made "high" (standard CMOS logic level), the respective switch goes into its conductive (ön") state. When the control line is made "low," the switch turns off. Because it is MOSFETs we are turning on and off, the control lines draw negligible current (just like CMOS logic gate inputs). 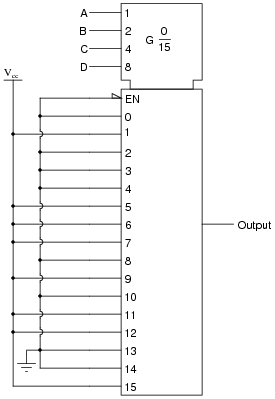 Identify the necessary "mystery device" shown in the schematic, which allows a binary input (S0 and S1 with four combinations of high/low states: 00, 01, 10, and 11) to activate just one bilateral switch at a time. This "mystery device" is a 2-line to 4-line binary decoder. 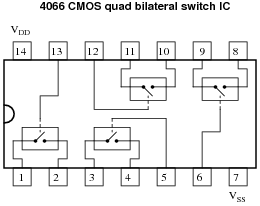 This question serves a few purposes: to introduce students to the 4066 quad bilateral switch, to showcase a practical application for analog multiplexing, and to review a previous subject (decoders). After identifying which is which, provide definitions for "multiplexer" and "demultiplexer" in your own words. I'll let you research the answer to this question on your own! This question forces students to directly face a point of confusion I have noticed over several years of teaching. Ask them where they were able to find definitions for each term. In particular, note the locations of the four ßelect" terminals, as well as the single output terminal. What types of electrical "data" may be ßelected" by this particular integrated circuit? For example, can it select an analog waveform, such as human speech from a microphone? 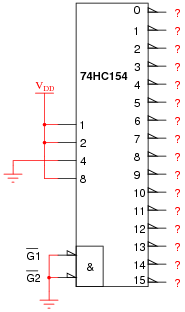 Is it limited to discrete TTL signals (low and high, 0 volts and 5 volts DC)? How can you tell? 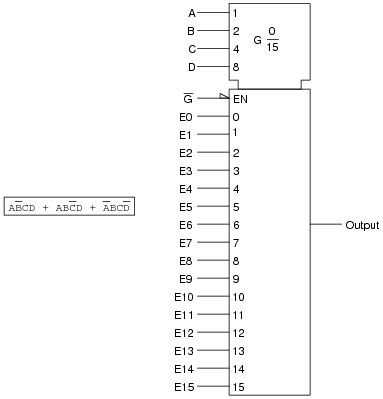 Did you really think I would just show you the pinout here, instead of having you consult a datasheet? This is a discrete-signal device, only. It cannot ßelect" analog signals such as those involved in telephony. Challenge question: how could you build an analog signal multiplexer, using components you are familiar with? I recommend you start with something simple, such as a four-channel multiplexer, before attempting something with as many channels as the digital device shown here (74HC150). Datasheets not only provide basic pinout information, but they also reveal important operational characteristics of integrated circuits. In many cases they also show typical applications, which have great educational value. Stress the importance of datasheets to your students with "look-up" exercises such as this, build their ability to interpret the information contained. 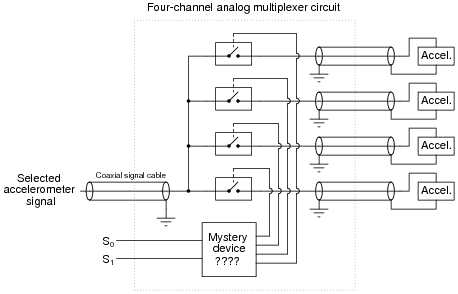 In regard to the challenge question, it is a common mistake for students to think they can build an analog signal multiplexer around a digital signal multiplexer. In actuality, they would need a completely different type of device! Show the wire connections necessary to make the multiplexer output the specified logic states in response to the data select (A, B, C, and D) inputs. Discuss with your students the significance of using a multiplexer in this fashion: to implement arbitrary logic functions. For those students who may not be familiar with the term, be sure to define the word ärbitrary." It may seem silly, but students often fail to ask for the definitions of words that are new to them, for fear of sounding dumb in front of their peers and in front of you. One more reason to model respect in your classroom, and also to create an atmosphere where students feel comfortable asking any question. Identify the logic states of all output terminals given the input conditions shown. In the first scenario with the enable lines grounded, output #11 will be low, with all other outputs high. In the second scenario with a square wave signal input to the enable lines, output #11 will pulse while all other outputs remain in the high state. 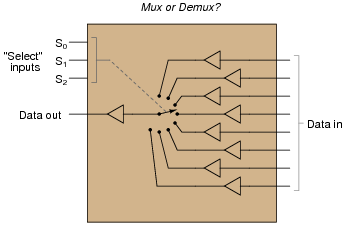 This question previews the use of a decoder as a demultiplexer. What terminal(s) do we use for the signal input, if using this chip as a demultiplexer and not just a decoder? Use the enable terminals (together) as one ïnput" terminal. Explain to your students that "decoder" and "demultiplexer" are really just two different words for the same device, seeing as how all real decoders come equipped with enable inputs. The 74HC137 and 74HC237 decoder/demultiplexer integrated circuits have a feature that some other decoder/demultiplexers do not: address latching. Explain what this additional feature is, how it works, and how you would disable the feature if you needed to use one of these integrated circuits in an application not requiring address latching. I'll let you figure out the answers to this question. The manufacturers' datasheet, of course, is probably your best source of information! Follow-up question: what is the functional difference between the 74HC137 and the 74HC237? 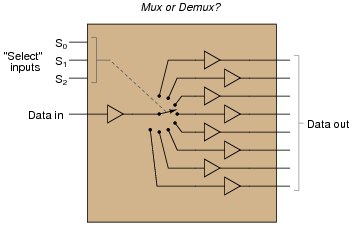 How would the respective schematic symbols for these two decoder/demux ICs differ? Challenge question: think of a practical application where you might need the feature of address latching. The feature of address latching is not hard to understand if students have already studied D-type latches (and/or parallel-in/parallel-out shift registers). When first learning about encoders, decoders, multiplexers, and demultiplexers, students often get them confused with one another. Write succinct definitions (complete with illustrations) for each of these four digital functions, based on your own research and written using your own words. Also, identify which two of these digital functions are usually performed by the same integrated circuit. I'll let you figure out the first part of the answer (four succinct definitions, complete with illustrations)! Because it is so easy to get these four functions mixed up in your mind, it is important that you arrive at your own understanding of which is which, rather than have someone else (like me) provide ready-made definitions for you to memorize. Decoding and demultiplexing are usually performed by the same integrated circuit device. A good example of this is the 74HC154. Here is a good example of where students like to fall on rote memorization, and where such shallow learning strategies often fail. It is imperative that students do their own research and cast these functions into their own personal terms. This way, they will understand the differences rather than just memorize the differences. Call on individual students to present their findings for this question, and let the classroom be a place where students share their understandings with one another. Let them know that this is important for them to grasp, but do not simply provide ready-made answers for them! Explain what effect a shorted bilateral switch would have on the output waveform. Be as specific as possible. If one of the bilateral switches were to fail shorted, it would skew all the arbitrary waveform voltages "toward" the one with the failed switch, distorting the waveform from its original shape. A failed-shorted bilateral switch would create a sort of passive averager circuit between the shorted-switch pot and the selected-switch pot. If your students have difficulty figuring out the effects of this fault, remind them of what a passive averager is, and how it works. Clock pulse generator stops pulsing: Only one channel out of the eight will work, and it works all the time without interruption. Data cannot get through any of the other seven channels. 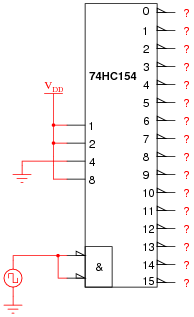 Pin breaks on the W output of 74151 chip, leaving that wire floating: All selected outputs on the 74138 chip go low, instead of repeating the respective logic states input at the 74151 chip. Pin breaks on G2A input of 74138 chip, leaving it floating: All outputs on the 74138 chip go high, all the time. 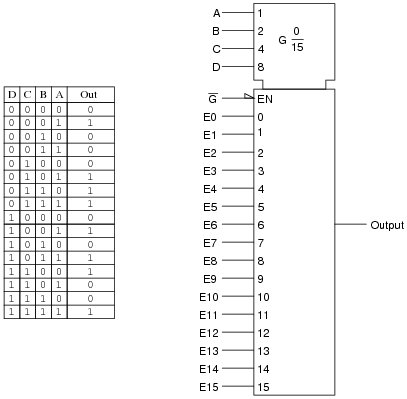 Enable pin breaks on 74151 chip, leaving it floating: All selected outputs on the 74138 chip go low, instead of repeating the respective logic states input at the 74151 chip. 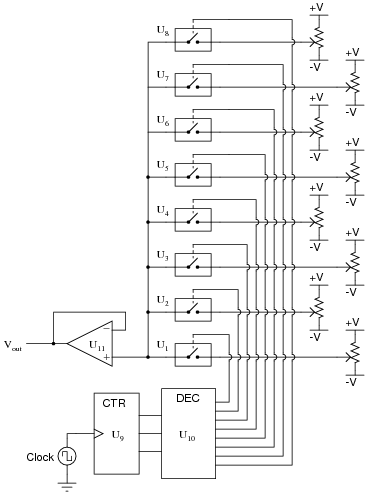 Follow-up question: what if this multiplexer had an active-low output, like the 74150? How would this change your design for implementing the truth table? Determine what state the ßelect control" input line has to be in to select InputA to be sent to the output, and what state it has to be in to select InputB to go to the output. A high signal on the ßelect control" line selects InputA, while a low signal on that same line selects InputB. 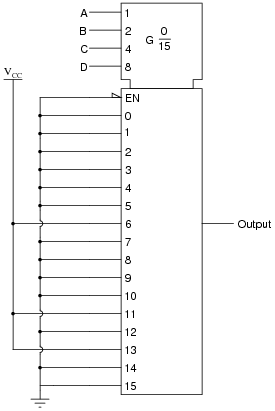 Selector circuits are widely used internally in counter and shift register circuits where digital signals must be selected from multiple sources to achieve certain functions. Be sure your students understand how it works, for they will surely see it later in some application!